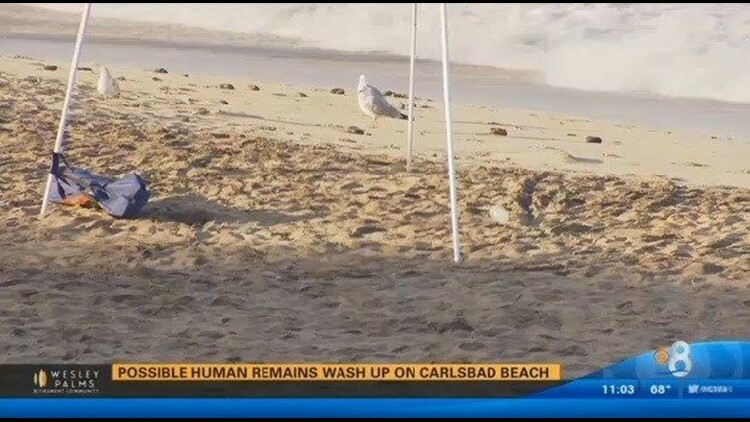 Bones found inside a rubber hip boot that washed up on a Carlsbad beach this week are human, authorities confirmed Thursday. SAN DIEGO (CNS) - Bones found inside a rubber hip boot that washed up on a Carlsbad beach this week are human, authorities confirmed Thursday. A passer-by found the piece of heavy-duty footwear on the shoreline near the terminus of Oak Avenue about 3:30 a.m., Wednesday and notified the police upon seeing what was inside it, officials said. A pathologist with the Medical Examiner's Office determined that the remains inside the boot were a partial left tibia and foot bones consistent with a those of a muscular, roughly 5-foot-9-inch man who likely died about a month ago. The case is being investigated as a suspected drowning, the Medical Examiner's Office reported.